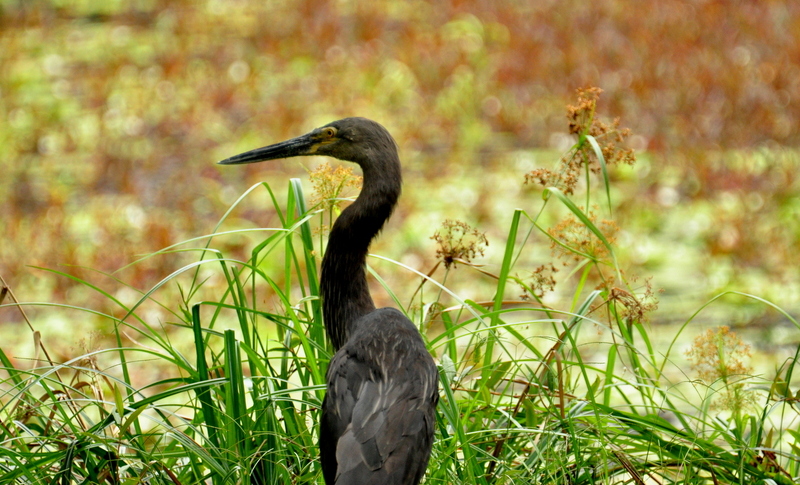 In mid November, some tourists on the Daintree River witnessed two Great-billed Herons fighting on the river bank. As the bird watchers keenly observed the fracas, the birds fell into the water and a nearby crocodile took the opportunity to grab one of them. 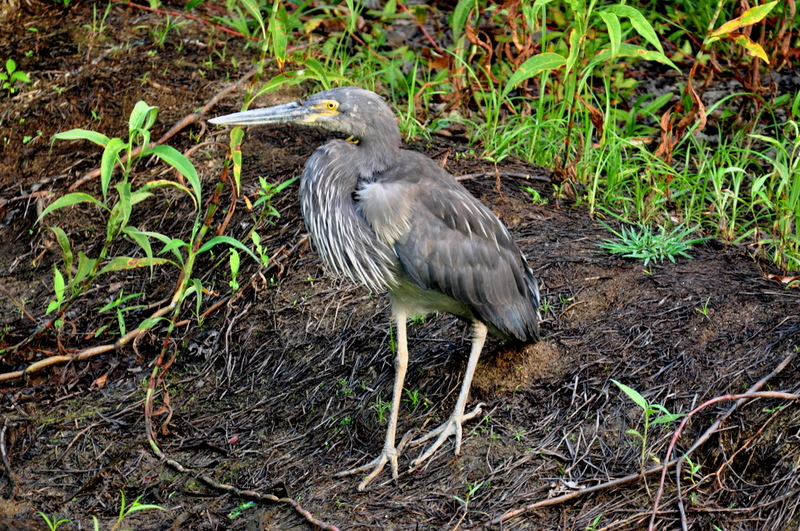 Subsequent to this event being reported on the local network we noticed that the Great-billed Heron we regularly see on our wetlands was limping and looking a bit sorry for himself. (There has been a presumption that it was two males fighting) During the last week he has improved considerably – we have seen him quite frequently and, perhaps due to his bruises, he hasn’t been in a hurry to fly off as soon as he catches sight of us. November 21st feeling a bit sorry for itself – a few days after the reported fracas. Today we were spending some time with a fellow birding friend who was visiting from Cairns and so, after a walk around some of the tracks, we sat in the bird hide chatting and exchanging stories. As we were watching a Little Egret land in a tree in the distance, the Great-billed Heron flew across in front of us and landed on the bund wall in full view. Although we kept chatting the bird was unperturbed by us. It was, however, disturbed by some Figbirds which caused it to ruffle up its plumes then give us a demonstration of its guttural call before eventually flying a little further on to hunt along the exposed muddy bank. What a privilege to have the pleasure of seeing such a shy bird, not only finding our wetlands a reliable feeding ground but starting to feel less threatened by our presence nearby. 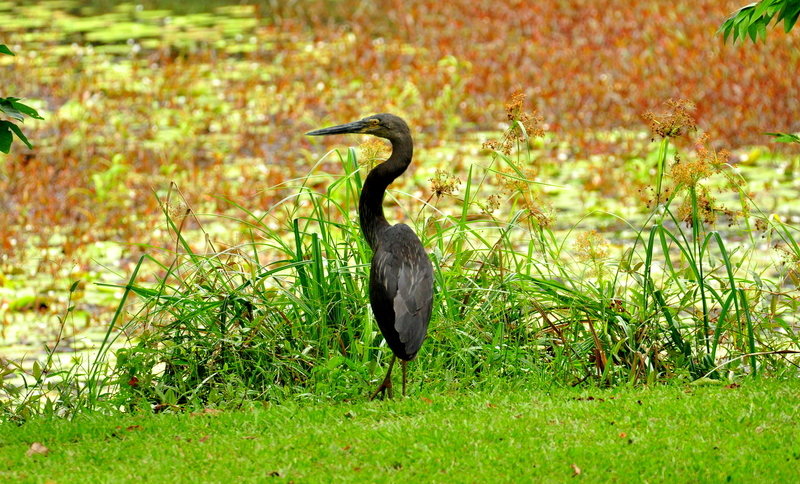 This entry was posted in Bird Observations and tagged Daintree birds, Daintree wetlands, Great-billed Heron. Bookmark the permalink.